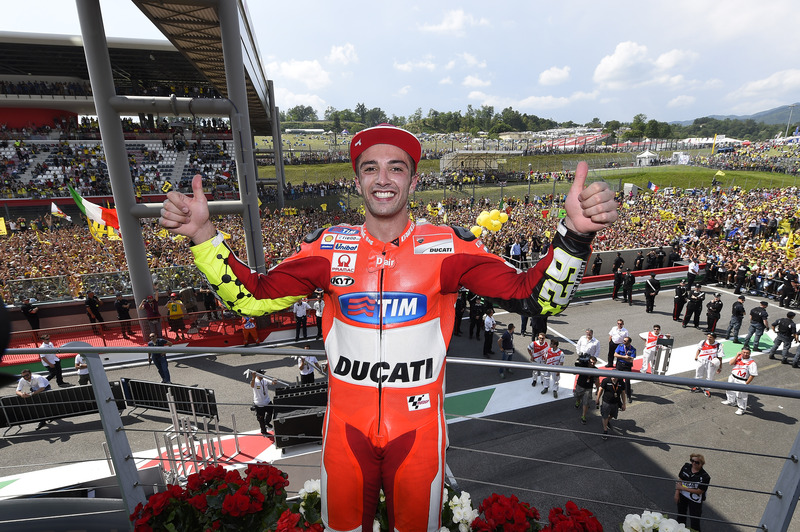 Ducati Factory rider Andrea Iannone had a dream Italian GP after scoring his best-ever finish in MotoGP, taking the runner-up slot in the race at Mugello. Iannone looked to get a jump start as he started from pole position, but regrouped to take 20 points for second. After crossing the line at the end of the opening lap in third place, Iannone was then passed by Marquez one lap later and he remained fourth until lap 9. On the tenth lap Andrea then passed both Dovizioso and Marquez to move into second, and he held onto that place until the chequered flag despite coming under attack from Marquez, who crashed out, and a rapidly recovering Rossi. Thanks to this result, Iannone has now moved into fourth place overall in the standings with 81 points. He said: “I am so pleased with today’s result: it was incredible, because today it was not easy to score a podium finish. My team did a great job, the bike worked really well and the Clinica Mobile gave me a big hand throughout the weekend. This GP15 is a really great bike, and I was able to administer the race really well. Team-mate Dovizioso enjoyed a less successful home GP, with a rear sprocket problem causing him to slow and then enter the pits on lap 14. The Yamaha MotoGP squad enjoyed a successful day at Mugello, with Jorge Lorenzo claiming a flawless victory and local hero Valentino Rossi claiming a hard-fought third place – his sixth consecutive podium. After a flying start from second on the grid, Lorenzo tucked in behind Andrea Iannone and Andrea Dovizioso before moving up from third to lead the way when he crossed the line for the first time. 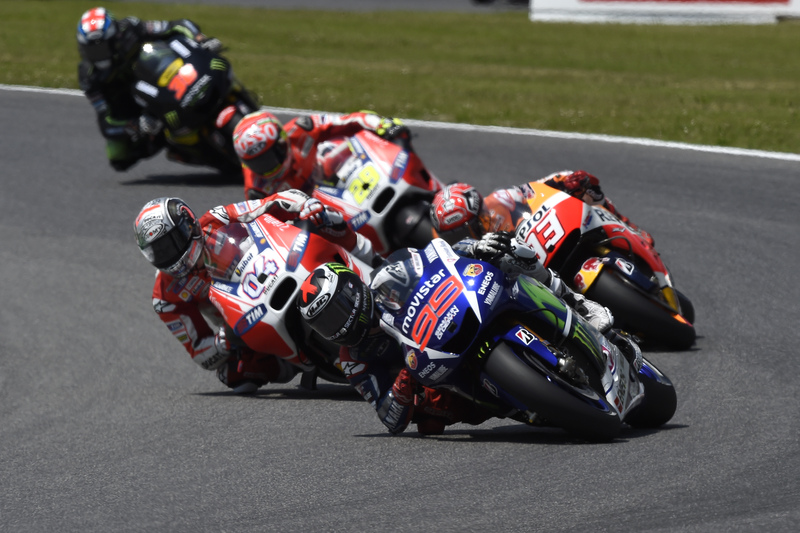 With a clear track ahead of him, Lorenzo put the put the hammer down and pulled away from the chasing pack. He gradually built a gap and remained untouchable for the rest of the race – his third win at the Mugello circuit in four years. His team-mate had an equally impressive race. Starting from eighth on the grid, Rossi lost time when he got caught up in the pack and finished the first lap in ninth. He quickly made his way through the field, hunting for Cal Crutchlow riding in sixth and overtaking him on lap eight. It took The Doctor four laps to close down a 2.5s gap to the group battling for second place. He immediately passed Dovizioso for fifth before closing in on Pedrosa, Marquez and Iannone. Rossi had his mind set on the podium and, having watched Marquez crash out, he was quick to make a move on Pedrosa for third. He pushed hard to close in on Iannone, setting a personal best of 1.48.173, but was unable to catch his compatriot and secured the last podium place, 6.661s from his teammate, accomplishing a third consecutive double podium for Yamaha. Lorenzo said: “I’m very happy, because I didn’t expect to escape with such a big margin, but sometimes it happens that you feel great on the bike. Today the track was not so quick so everyone has been a bit slower than we expected. I was the only rider to ride multiple 1’47s, so luckily for me I was gaining six or seven-tenths per lap, this was key to the win of the race. Lorenzo’s 25 point score adds to his total of 112 points, keeping him in second position in the standings. He is six points behind teammate and championship leader Rossi, whose 16 points put him on 118 points. It was a day of mixed fortunes for the Repsol Honda riders, Dani Pedrosa and Marc Marquez, with Pedrosa finishing in an impressive fourth place while Marc Marquez crashed out. Starting seventh on the grid, Pedrosa lost a few places, briefly dropping down to ninth on the first lap. Marquez, starting from 13th place – the first time he has not qualified on the first or second row in the premiere class – got off to a lightning start and moved up to sixth in the first few corners and up to fourth by the end of the first lap, with Pedrosa running in 8th. Pedrosa continued to catch the leading group, passing Cal Crutchlow, Pol Espargaro and Bradley Smith to find himself in fifth by lap four. Meanwhile, Jorge Lorenzo opened up a lead at the front as Marquez battled with Andrea Iannone and Andrea Dovizioso. By lap twelve Pedrosa had latched on to the battle for second and the four riders swapped positions consistently over the course of the following five laps. However, on lap eighteen after battling with Iannone, Marquez made a small mistake and crashed out in turn three. This briefly promoted Pedrosa to third before Valentino Rossi passed him and demoted Pedrosa to fourth, where he eventually finished the race. 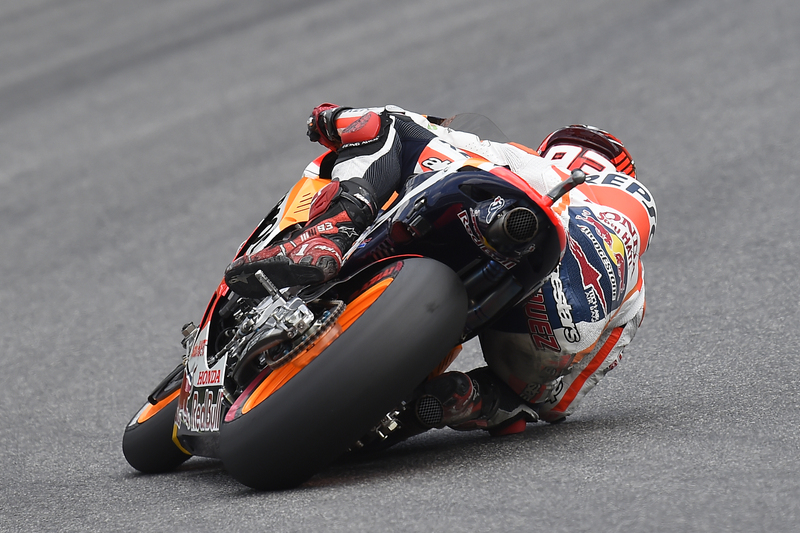 A downbeat Marquez said: “It was a shame about the crash today, because I had already done the hardest part! I’m happy because I was able to carry out our plan, which was to try to recover positions on the first five laps. We were up into second place after four laps, but when the tyre grip went down we had a similar problem to before, with the tyre sliding on corner entry. Tomorrow Marc and Dani will be back on track for a post-race test with the new 2016 tyre supplier, before heading west for round seven in Barcelona in two weeks time. 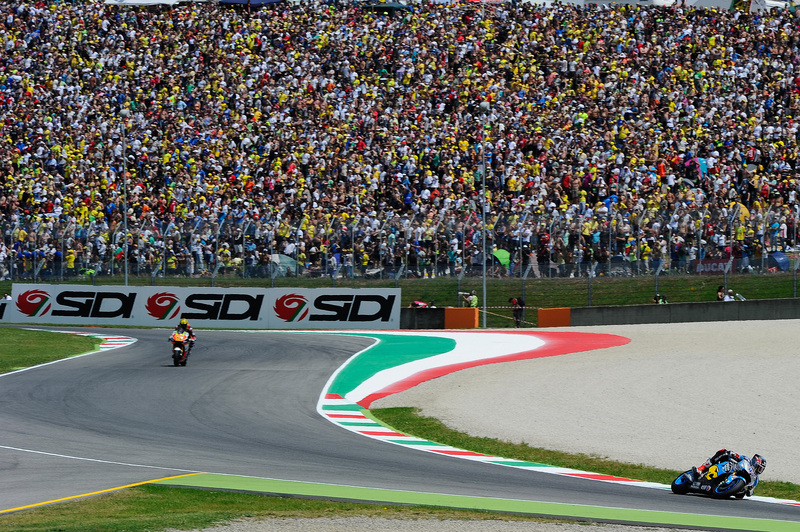 A massive crowd of close to 91,000 fans saw Marc VDS rider Scott Redding battle to a hard fought 11th place finish in the Italian Grand Prix at Mugello. An aggressive first lap from the 22-year-old moved him into the early fight for the top 10 from 17th on the grid, but all of his hard work was undone when he ran wide at the first turn on lap two and dropped down to 19th. 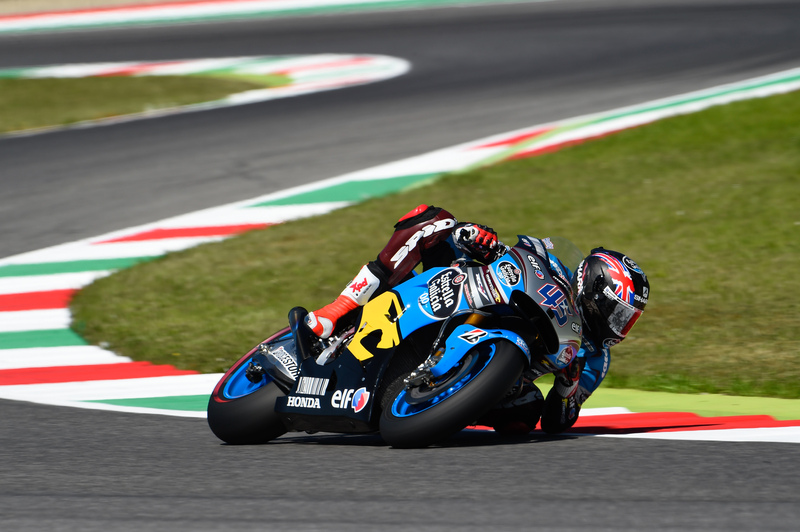 Quickly back into his rhythm, Redding set about charging back towards the top 10 when a lack of rear grip and agility with his Honda RC213V machine through Mugello’s series of fast changes of directions halted his challenge. 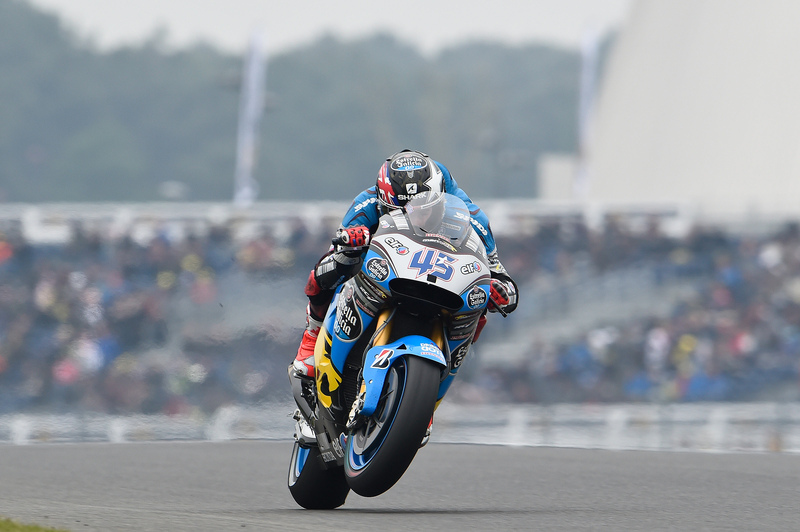 Redding crossed the line in 11th place to score points for the fourth time in six races, and he is confident of a stronger top 10 challenge when the 2015 World Championship resumes in Barcelona next month. He said: “I’m disappointed because the race obviously didn’t pan out as I’d expected. After the Warm-Up I thought I could be fighting for the top 10 and I made a good start and made up some places on the first lap. But on lap two I went deep into the first corner and lost all the places I’d gained. Cal Crutchlow endured a hugely disappointing race at Mugello after crashing out three laps from the end when placed fifth. The CWM LCR Honda rider defied a hand injury picked up from a fast fall in this morning’s warm-up to produce a brave ride and looked poised for a good points finish. But having battled front end problems all race, the Briton finally succumbed three laps from the chequered flag and went over at the fast turn eight, sustaining a dislocated ankle for his troubles. 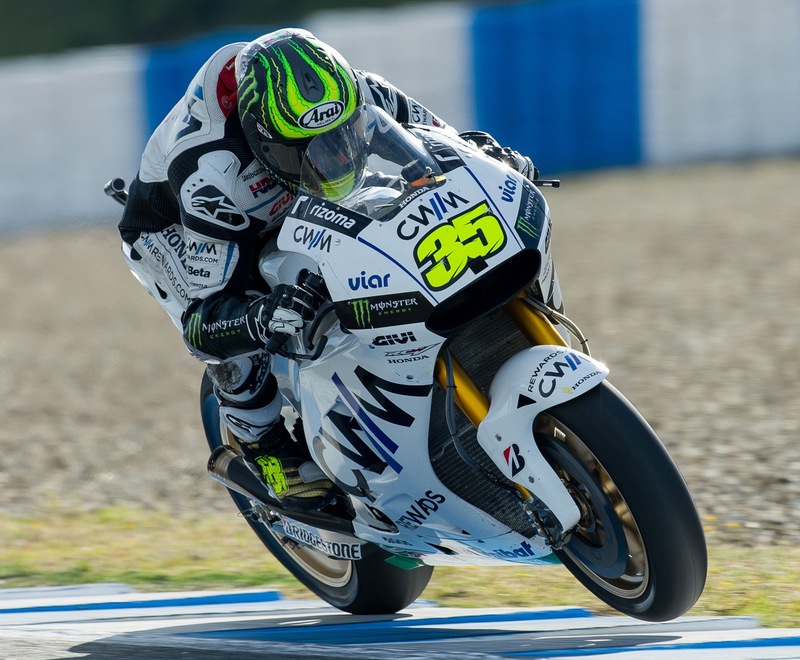 Crutchlow said: “It’s very disappointing. We had what I thought was a good weekend up until the race. This morning I had a very heavy crash in the warm-up and had a big impact on my hand, so I thought it was a good showing to be racing in the position that I was. “We had the 38 front tyre which meant steering the bike was not easy, but overall we were not so far off the factory guys and with the right setting I think we could have been higher. “Unfortunately the front tyre failed me in the end and just tucked under at a very fast corner. My foot got caught in the back of the bike and dislocated my ankle so I’m in a lot of pain and we’ll have to monitor the situation but I’ve had good treatment. Scott Redding will line up 17th on the grid for tomorrow’s Italian Grand Prix at Mugello. The Marc VDS rider failed to make it through to QP2 automatically and with fast times in QP1 he was unable to challenge for a top two spot and earn a place in the final qualifying shootout. The 22-year-old had made progress with improving his feeling on the Factory spec RC213V Honda on Friday but with the Factory class riders not being able to use the extra soft tyre, Redding was unable to match the pace of the leaders in the first qualifying session. Traffic was also an issue for Redding during the session. With 16 riders sharing the 5.2km Mugello circuit, all were looking to lap with each other to take advantage of a crucial slipstream, making finding space on the track a real challenge. 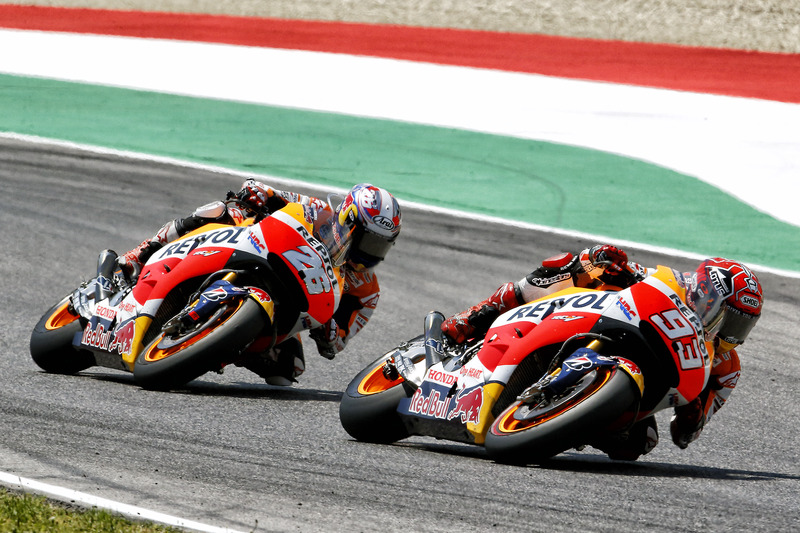 Honda Respol duo Marc Marquez and Dani Pedrosa struggled during qualifying at Mugello, with the reigning world champion only managing to post the 13th quickest time. Pedrosa, was the first out on track – taking provisional pole – and was consistently fast and improved on his second run, but with such a small gap separating the riders he was unable to place higher than seventh with his time of 1’46.875, just 0.3 seconds off pole position. Marquez had a small crash in turn one during FP4 having already missed out on pre-qualifying for Q2 by 0.022 seconds, and had to take part in Q1 where he suffered heavily with rear grip and his time of 1’47.240. His time was not good enough to see him through to Q2, leaving him on the 5th row in 13th for tomorrow’s 23 lap race. 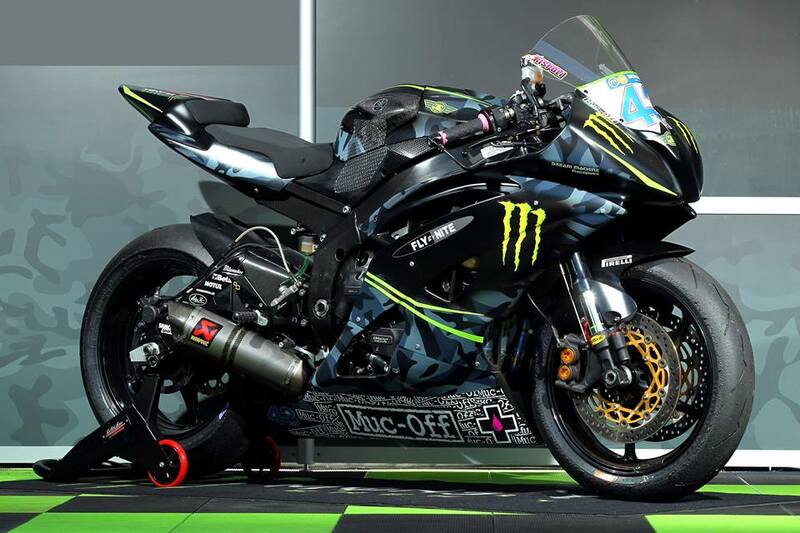 Isle of Man TT record-breaker Ian Hutchinson will line up in the Supersport TT races after sealing a last minute deal with Team Traction Control to campaign their Yamaha R6 as he bids to add to his eight TT victories. The Bingley Bullet, the first rider to clinch five solo victories at the event in 2010, returns to the Island feeling confident of a strong performance and is aiming to return to the TT podium after missing out through injury in recent years. Hutchinson said: “It is a privilege to be working with Keith Flint and the team and I know how much they love their racing. I have worked with Grant [Bunting] from TTC before so to be able to have this opportunity to work with them is just what I need. Hutchinson had been set to ride for the Tsingtao MV Agusta squad but the team was forced to withdraw at the 11th hour after it was unable to prepare its machines in time. Scott Redding heads to this weekend’s Italian Grand Prix at Mugello, round six of the 2015 MotoGP World Championship, determined to find a solution to the set up issues that have hampered his progress in all but one race this season. In what has proved to be a difficult start to his first season aboard the factory Honda RC213V, Redding has only one top ten finish to his name, while crashes in Austin and Le Mans mean he currently lies only 13th in the championship standings, well short of both his and the team’s expectations. It’s a situation that the 22-year-old is keen to reverse this weekend in Mugello, a track at which he dominated proceedings two years ago, winning the Moto2 race comfortably from pole position. The Mugello track itself could prove to be a major factor in a Redding revival this weekend, as grip levels are high and, as he showed during practice and qualifying in Austin earlier in the season, when grip is available the 22-year-old Briton knows how to take full advantage of it. Redding said: “The only goal this weekend in Mugello is to find a solution to the problems we had in both Jerez and Le Mans. It seems that when grip is hard to find then we suffer a lot more with the front than the other Honda riders and that’s something we need to get to the bottom of. However, it may not be such an issue this weekend, as Mugello is a track where there is normally a lot of grip and that could help us. Lincolnshire lad Gary Johnson heads to the Isle of Man in good spirits after a strong pre-season test. The GBmoto Racing Kawasaki rider will be competing in the Superbike, Superstock and Senior races for the team. 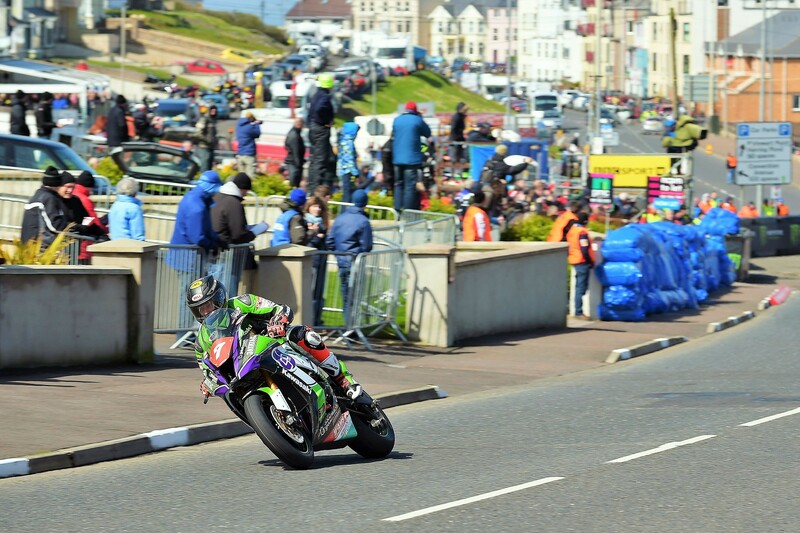 The team’s pre-season testing programme saw Kawasaki Racing Engineer Ichiro Yoda build Superbike and Superstock specification Kawasaki Ninja ZX-10Rs and this hard work enabled the team to immediately qualify in second place at their road racing debut at the North West 200. However, inclement weather and minor machine troubles plagued race day. Despite this, the team were still able to further develop both motorcycles and head to the iconic Isle of Man TT confident of a strong showing in all three races. Johnson said: “This is it, the big one! The Isle of Man TT is the event that everything else is built around and these two weeks are really the main focus for the year. Heading over this year with a factory team like GBmoto means I’m in a really good shape and can focus on riding, rather than preparing the machines myself. “If we just look at the results, then the North West 200 doesn’t look very successful, but the truth is we were able to really improve both the Superbike and Superstock machine. We head to the Isle of Man with two motorcycles that handle incredibly, are very stable and have more than enough power so I’m confident that we’ll be able to be challenging for some good results. Arguably one of the most iconic motorsport events in the world, the 37 ¾ mile TT course sees rider’s race around closed public roads against the clock, setting an average speed of over 130mph. Opening practice begins on Monday 1 June, with the Superbike race held on June 6, Superstock on June 8 and the Senior closing the festivities on June 12.